The wwPDB/EMDataBank electron microscopy (EM)/electron crystallography (EC) map and model validation reports are prepared according to the recommendations of the EM Validation Task Force (EM VTF; Henderson et al., 2012) and reuse common elements from X-ray reports (Read et al., 2011). The EM/EC map and model reports summarise the quality of the structure and highlight specific concerns about the atomic model and report statistics about the reconstruction. The title page shows some information about the entry deposition as well as the names and version numbers of the software tools and reference information used to produce the report. The title page will also show the type of the report (whether it is prelimary, confidential or for a publically released PDB entry) and its length, for more details see FAQ on report types. This section provides a succinct "executive" summary of key quality indicators. If there should be serious issues with a structure, this would usually be evident from this summary. The metrics shown in the "slider" graphic (see example below) compare several important global quality indicators for this structure with those of previously deposited PDB entries. The comparison is carried out by calculation of the percentile rank, i.e. the percentage of entries that are equal or poorer than this structure in terms of a quality indicator. The global percentile ranks (black vertical boxes) are calculated with respect to all structures available in the PDB archive up to 28 December 2016. The EM model-specific percentile ranks (white vertical boxes) are calculated with respect to all EM and EC (combined) model entries in the PDB. In general, one would of course like all sliders to lie to the far right in the blue areas (especially for recently determined structures, and in particular the EM/EC model-specific sliders). This score is derived from the number of pairs of atoms in the model that are unusually close to each other. It is calculated by MolProbity (Chen et al., 2010) and expressed as the number or such clashes per thousand atoms. Further information can be found in the Close contacts section of the report, as described below. A residue is considered to be a Ramachandran plot outlier if the combination of its φ and ψ torsion angles is unusual, as assessed by MolProbity (Chen et al., 2010). The Ramachandran outlier score for an entry is calculated as the percentage of Ramachandran outliers with respect to the total number of residues in the entry for which the outlier assessment is available. Further information can be found in the Torsion angles, Protein backbone section of the report, as described below. Protein sidechains mostly adopt certain (combinations of) preferred torsion angle values (called rotamers or rotameric conformers), much like their backbone torsion angles (as assessed in the Ramachandran analysis). MolProbity considers the sidechain conformation of a residue to be an outlier if its set of torsion angles is not similar to any preferred combination. The sidechain outlier score is calculated as the percentage of residues with an unusual sidechain conformation with respect to the total number of residues for which the assessment is available. Like the protein backbone and sidechains, the RNA backbone also adopts certain sets of preferred torsion angle values. Based on statistical analysis of RNA chains in the PDB, MolProbity (Chen et al., 2010) assigns a score per nucleotide for the quality of its backbone. This metric is calculated as the average score of all nucleotides in the entry. For more information about validation metrics, see Henderson et al. (2012) and the review by Kleywegt (2000). There may be green, yellow, orange and red portions in the bar for each chain, indicating the fraction of residues that contain outliers for 0, 1, 2, ≥3 model-only validation criteria, respectively. A grey segment indicates residues present in the sample but not modelled in the final structure. The numeric value for each fraction is shown below the corresponding segment. Values <5% are indicated with a dot. 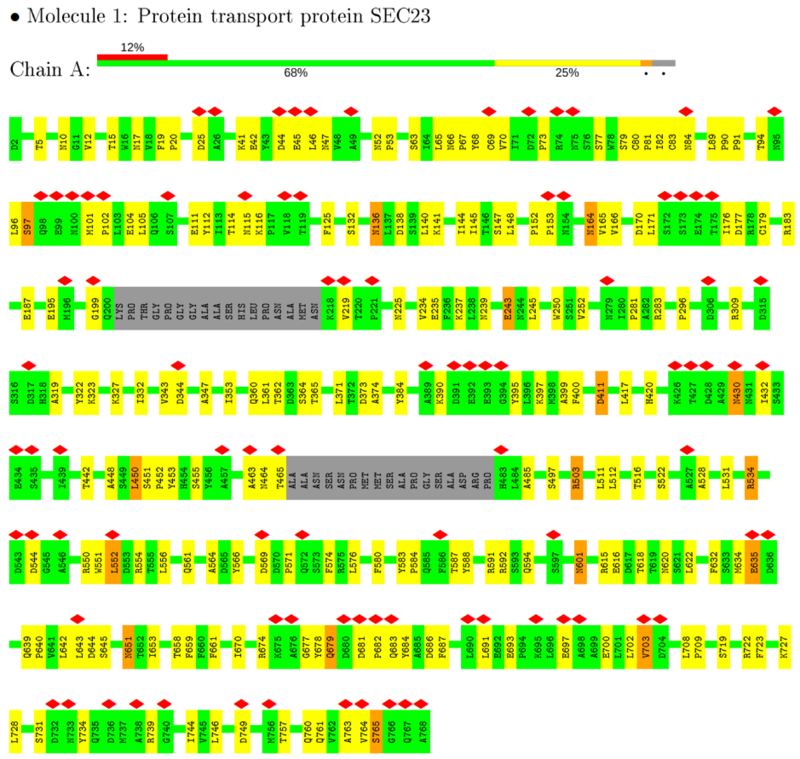 The Quality of chain chart shows the fraction of residues in each chain that are flagged as unusual according to the validation criteria used rather than where in the sequence this occurs (the plots are a kind of horizontal pie chart). The following section Residue-property plots provides a graphic showing where in the sequence the issues occur. The identifier of the molecule (for experts: this is the same as the "entity id" in the mmCIF file of the entry). The instance identifier. If there is more than one model present in the entry, the chain is prefixed with a model number. The number of residues in the molecule. This tabulates the counts of various element types in the molecule. The number of residues in the molecule that have been modelled with a reduced set of atoms. Protein or nucleic acid chains may be modelled with only one or two atoms (e.g. Cα, Cβ, P, an atom in a sugar ring or nucleobase, etc.). Typically, such cases are observed when the experimental data is insufficient to confidently model all atoms. The Mol and Chain identifiers are also used in other tables in the report. This section shows summary plots of quality information for protein, RNA and DNA molecules on a per-residue basis. The second graphic shows the sequence annotated by these criteria with outliers in model quality (see example graphic below). The colour-coding described above is used here too. Consecutive stretches of residues for which no outliers were detected at all are not shown individually, but indicated by a green connector. Residues absent from the final model are shown in grey. In general, the less red, orange, yellow and grey these plots contain, the better. It is important to realise that residues that are outliers on one or more model-validation criteria could be either errors in the model, or reflect genuine features of the structure. Careful analysis of the experimental data is typically required to make the distinction. Outlier residues that are important for structure or function (e.g., enzymatic residues, interface residues, ligand-binding residues) should be inspected extra carefully (and addressed in a manuscript describing the structure). Details of the outliers found for a residue can be found further down the report, in the Model quality section. This section reports experimental details about the map structure determination. Quality statistics in this section are calculated using standard compilations of covalent geometry parameters (Engh & Huber, 2001; Parkinson et al., 1996), tools in MolProbity (Chen et al., 2010), Validation-pack (Feng et al.) and the wwPDB chemical component dictionary (CCD). This section describes the quality of the covalent geometry for protein, DNA and RNA molecules in terms of bond lengths, bond angles, chirality and planarity. There are two tables providing a per-molecule summary and four tables that provide information on (some of) the outliers for each criterion (if any; otherwise the table is omitted). The root-mean-square value of the Z-scores (RMSZ) of bond lengths (or angles) is calculated for individual residues and then averaged for each chain and over the whole molecule. RMSZ scores are expected to lie between 0 and 1. Individual bond lengths or angles with a Z-score greater than 5 or less than -5 merit inspection. The RMSZ sub-column gives the Root Mean Squared Z score of all bond lengths analyzed. The RMSZ sub-column gives the Root Mean Squared Z score of all bond angles analyzed. † The percentage of outliers is listed in parentheses. Deviations from expected chirality and planarity in the model are calculated by Validation-pack (Feng et al.). Chiral centres for all compounds occurring in the PDB are described in the chemical component dictionary. Chirality can be assessed in a number of ways, including calculation of the chiral volume, e.g. for the Cα of amino acids this is 2.6 or -2.6 Å3 for L or D configurations, respectively. If the sign of the computed volume is incorrect, the handedness is wrong. If the absolute volume is less than 0.7Å3 , the chiral centre has been modelled as a planar moiety which is very likely to be erroneous. Chirality deviations are summarised per chain. Sidechain: Certain groups of atoms in protein sidechains and nucleotide bases are expected to be in the same plane. An atom"s deviation from planarity is calculated by fitting a plane through these atoms and then calculating distance of individual atom from the plane. Expected value of such distances have been pre-calculated from data analysis (wwPDB, 2012). If an atom is modelled to be more than six times farther than the pre-calculated value, the residue is flagged to have a sidechain planarity deviation. Peptide: A deviation is flagged if the omega torsion angle of a peptide group differs by more than 30° from the values expected for a proper cis or trans conformation (0° and 180°, respectively). Main chain: The N atom of an amino acid residue is expected to be in the same plane as the Cα, C, and O atoms of the previous residue. If it is out of plane by more than 10°, this is flagged as a planarity deviation. Where outliers exist, up to five for each category are listed in a table in the Summary Report, whereas the Full Report will list all the outliers found. For bond lengths and bond angles, the worst outliers are reported. The residue number. Where applicable, an insertion code and alternative conformation identifier are specified as well. names of atoms involved in the bond or angle. The Z-score of the bond length or angle. The observed value of the bond length or angle. The ideal value of the bond length or angle. The planarity deviation type, i.e. sidechain, main chain or peptide as described above. This section provides details about too-close contacts between pairs of atoms that are not bonded where there is an unfavorable steric overlaps of van der Waals shells (clashes). All-atom contacts are calculated by the Reduce and Probe programs within MolProbity (Word et al., 1999; Chen et al., 2010). This method was developed to quantify the detailed non-covalent fit of atomic interactions within or between molecules (H-bonds, favorable van der Waals, and steric clashes). Since most such interactions involve H atoms on one or both sides, all hydrogens must be present or added (Reduce optimizes rotation of OH, SH, NH3, etc. within H-bond networks, but methyls stay staggered). At present, in order to ensure comparable scores between NMR and X-ray, hydrogen atoms are removed from the analysed structure, and replaced by a different set placed by Reduce in idealised and optimized nuclear-H positions. All-atom unfavorable overlaps ≥0.4Å are then identified as clashes, using van der Waals radii tuned for the nuclear H positions suitable for NMR (rather than the electron-cloud H positions suitable for X-ray). MolProbity then calculates an all-atom clashscore, which is defined as the number of clashes per 1000 atoms (including hydrogens). Percentile scores of the clashscore are also computed, to allow assessment of how the structure compares to the rest of the archive. The number of non-hydrogen atoms modelled. The number of hydrogen atoms modelled. The number of hydrogen atoms added by MolProbity. The number of clashes in which the atoms in this instance of the molecule are involved. List the symmetry-related clashes in a crystal structure - the values should always be zero for EM structures. The molecule identifier, instance identifier, residue number, residue name and atom name for the first atom. where applicable, the chain identifier is prefixed with model number and an alternative conformation identifier is shown as a suffix to the atom name. Identifies the second atom in the clash. The distance between Atom-1 and Atom-2 in Å.
the "magnitude" of the clash is assessed by MolProbity. the MolProbity "magnitude" of a clash is defined as the difference between the observed interatomic distance and the sum of the van der Waals radii of the atoms involved (Chen et al., 2010). The radii used are tuned for use with nuclear H positions suited for NMR (rather than the electron-cloud H positions used for X-ray). In a Summary Report up to five of the worst clashes are listed in the table, whereas in a Full Report all the clashes are listed. Please see FAQs on: Why are there clashes reported between hydrogen atoms that are not present in the deposited model?. and What to do about reported clashes? This section is populated if there are protein molecules present in the entry. The conformation of a protein backbone can be described by a pair of torsion angles (phi, psi) per residue (the remaining torsion angle, omega, is usually 180°). Ramachandran plots show the combinations of phi-psi values in a structure and typically compare these to a distribution of commonly observed values in high-resolution crystal structures. MolProbity’s Ramachandran plots are residue-type specific, derived from a high-quality subset of protein X-ray structures and divided into favoured, allowed and outlier regions. Favoured and allowed regions are defined to be the regions that include 98% and 99.95%, respectively, of the residues in the high-quality data (see (Chen et al., 2010). for more details). This section contains a summary of analysis of the backbone torsion angles phi and psi by Molprobilty. The first number here is the number of residues in the chain for which MolProbity output is available. The second number is the total number of residues in the chain. Phi and psi angles cannot be analysed for terminal residues, non-standard residues or for residues with incompletely modelled main chain. The number (and percentage) of residues in the favoured, allowed and outlier regions respectively, of the residue-specific phi-psi plots. Protein sidechain conformation can be described by the chi torsion angles. Depending on residue type, these angles adopt certain preferred sets of values (also termed rotamers or rotameric conformers). Based on analysis of high quality X-ray entries in the PDB, MolProbity assesses whether a sidechain is similar to one of the preferred sets of torsion angles, or is an outlier (see (Chen et al., 2010). for more details). This section is based on MolProbity analysis of sidechains. The first number here is the number of residues in the chain which were analysed by MolProbity. The second number is the total number of residues in the chain. Chi torsion angles cannot be analysed for non-standard residues or for residues with incompletely modelled sidechains. The number (and percentage) of residues with favoured, and unusual chi torsion angles respectively. Where outliers exist, up to five randomly chosen are listed in a table in the Summary Report, whereas the Full Report will list all the outliers found. This section describes the quality of RNA chains using MolProbity’s analysis of ribose sugar puckers and rotameric nature of "suites" of backbone torsion angles (see Richardson et al., 2008, and Chen et al., 2010 for details). A suite consists of the torsion angles between the sugars in two RNA nucleotides and is identified by the 3' nucleotide. The first number here is the number of backbone suites for which analysis was carried out, and the latter number is the total number of nucleotides. The former is a smaller number because a suite is not defined at 5'-end, or a suite might be incompletely modelled. The percentage of nucleotide suites in the chain which Molprobitiy identified as an outlier. The percentage of sugar pucker outliers in the chain which Molprobitiy identified as an outlier. These are nucleotides where the strong correlation between sugar pucker and distance between the glycosidic bond vector and the following phosphate is violated. The overall suiteness parameter as defined by Molprobity. Where backbone or pucker outliers exist, up to five randomly chosen are listed in a table in the Summary Report, whereas the Full Report will list all the outliers found. Bond lengths, bond angles, acyclic torsions and isolated rings are assessed using the Mogul program (Bruno et al., 2004) by comparison with preferred molecular geometries derived from high-quality, small-molecule structures in the Cambridge Structural Database (CSD). Chirality is assessed by Validation-pack (Feng et al.). There are two summary tables providing a per-molecule overview and detailed tables that provide information on (some of) the outliers for each criterion (if any; otherwise the table is omitted). A Z-score is calculated for each bond length and bond angle in the molecule (A Z-score is generally defined as the difference between an observed value and an expected or average value, divided by the standard deviations of the latter.). Individual bond lengths or angles with a Z-score less than -2 or greater than 2 merit inspection. The root-mean-square value of the Z-scores (RMSZ) of bond lengths (or angles) is calculated for the whole molecule. RMSZ scores are expected to lie between 0 and 1. For low-resolution structures, geometry should be tightly restrained and small values are expected. For very high-resolution structures, values approaching 1 may be attained. Values greater than 1 indicate over-fitting of the data. The identifier(s) of the molecule(s) to which the residue is linked, e.g. by a covalent bond, salt bridge etc. Counts: This column gives 3 values: the number of bonds (or angles) analysed, the number of bonds (or angles) modelled in the residue and the number of bonds (or angles) defined in the PDB chemical component dictionary. The number of bonds (or angles) analysed may be less than observed due to the absence of comparable fragments in the Cambridge Structural Database. RMSZ: The root-mean-square value of the Z-scores (RMSZ) of all bond lengths (or angles). #|Z| >2: The number of bond lengths or bond angles that have a Z-score of less than -2 or greater than 2 compared to the total number of bonds / angles that have sufficient matches in the CSD is given in the #|Z| >2 column. In parentheses the number of outliers within the molecule is listed as a percentage. For acyclic torsion angles, Mogul provides a distribution of absolute values of torsion angles observed in comparable fragments in the Cambridge Structural Database. This distribution and the observed value are used to find a mean difference and the minimum difference, both of which have to be above 60° for the torsion to be flagged as an outlier. For isolated rings, Mogul compares the given ring with comparable rings in small molecules structures in the Cambridge Structural Database and calculates an RMSD value based on corresponding constituent torsion angles for each comparable ring. The mean and minimum of these RMSDs both have to be above 60° for the ring to be flagged an outlier. Note that the criteria used to flag a ring or torsion angle as an outlier are under development. The current criteria are very conservative. They will be refined following analysis of a large test set of ligands. One or more molecule identifiers to which the residue is linked, e.g. by a covalent bond, salt bridge etc. This column lists: the number of chiral outliers in the chain, the number of chiral centers analysed, the number of these observed in coordinates and the number defined in the PDB chemical component dictionary. 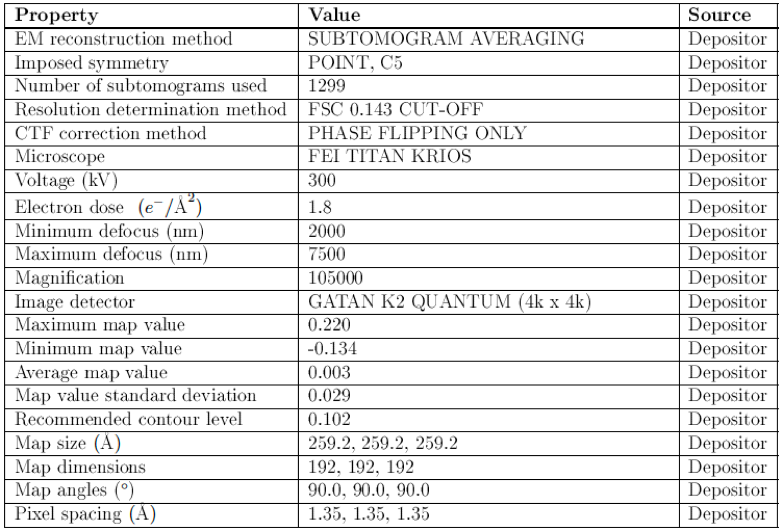 This column lists: the number of torsion angle outliers in the chain, the number of torsions analysed, the number of these observed in coordinates and the number defined in the PDB chemical component dictionary. 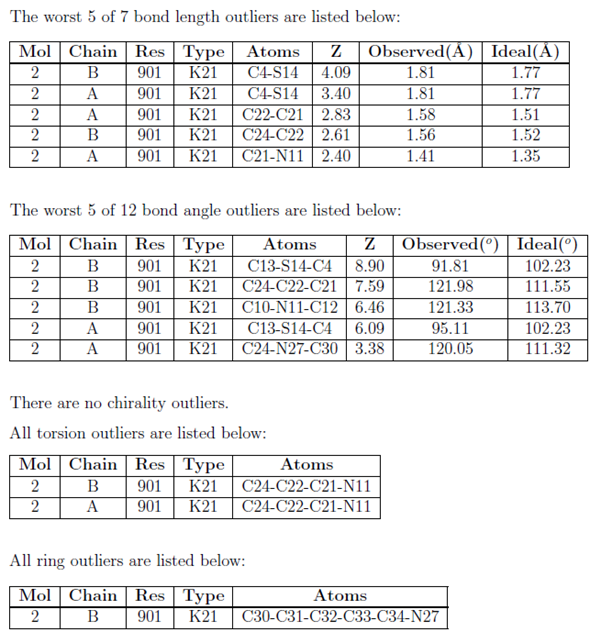 This column lists: the number of ring outliers in the chain, the number of rings analysed, the number of these observed in coordinates and the number defined in the PDB chemical component dictionary. Where outliers exist, up to five for each category are listed in a table in the Summary report, while the Full report lists all of them. Bond length and bond angle outliers are sorted by the Z-score (worst first). Other outliers are selected randomly in the Summary report. names of atoms involved in the bond, angle, torsion angle, ring, or the name of the chiral atom with the unusual deviation. The difference between observed and ideal values in terms of standard deviations. Any chain breaks are identified in this section. wwPDB. The standard geometry compilation used in wwPDB validation protocols, 2012.